Pictured from left: JM juniors Emily Patterson and Sadie Neuman enjoy giving blood during the school’s recent drive. 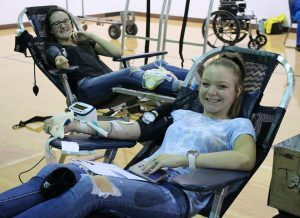 John Marshall High School’s Blood Drive Club teamed with the Marshall County Childhood Cancer Awareness Corporation and the Central Blood Bank last Tuesday for a drive in memory of former JM student Abby Frohnapfel. The blood drive attracted 138 registered donors with 121 usable units collected, breaking the drive’s previous record. Each unit has the potential to be used by up to three different people in need of blood locally. This marked the third year in a row the groups have held a blood drive in September during Childhood Cancer Awareness Month.